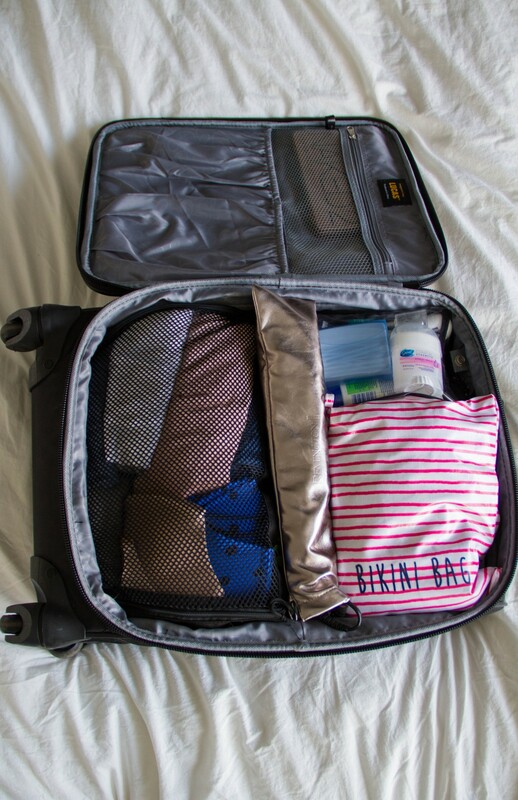 Jetsettin’: Packing for Italy! Family of 3 in one carry-on! In just a few short days, we will be heading out to Positano, Italy for a relative’s wedding. This trip came up much quicker than we anticipated so I haven’t had much time to get excited. I am kind of a freak when it comes to packing. I like to start packing well over a week in advance for trips but those days are long gone now that Ittybot is here. Now, I pack about a week to 3 days in advance. I thought I would share with you all how we jetsetters pack these days. Trust me, I’ve tried countless ways to pack and I think this is by far, my favorite. I found some newfeel packing cubes at a sporting good store in Amsterdam. It came in a pack of 3 sizes – sweater, t-shirt, and underwear. All 3 for 10 euros. 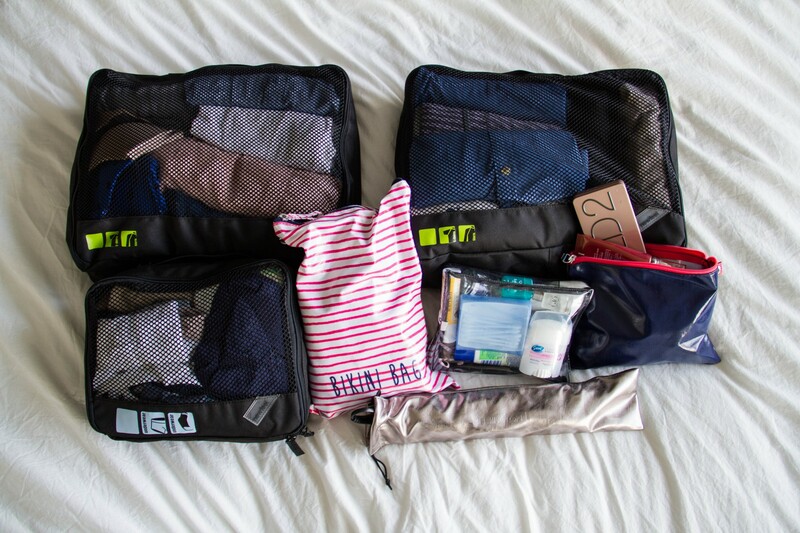 Eagle Creek is the more common, popular brand of packing cubes but they are a little on the spendy side here in Europe. I was a little apprehensive about the newfeel ones because I wasn’t sure if it would compress all the clothes in a perfect little cube. I have to say, I was pleasantly surprised that it met my expectations. I have the eagle creek packing envelope coming my way so I will get to see the difference in quality. As pictured, we each used the t-shirt cube size. In mine, I have 2 dresses, a button up, pants, 2 tanks, shorts, and 3 days worth of undergarments. In the Mr’s, we have 2 button ups, 2 pairs of shorts, 3 days worth of undergarments, 2 tanks, and 2 t-shirts. For Ittybot’s items, we used the undergarments cube which contained 12 diapers, 3 swimming diapers, pajamas, 3 t-shirts, a pair of shorts, his swimming trucks, rash guard, hat, a polo, and 2 pairs of pants. Note: I do roll almost everything. I will layer a couple of the thinner items like tank tops and roll those up too. I purchased a pack of 3 pouches at Primark for 6 euros. Note: I have a very unhealthy obsession with pouches. There is always a use for them! Anyways, the pack came with a very cute bikini bag. I put in 2 of my favorite swimming suits and 1 swimming trunk for the Mr.
Can’t forget the necessities like a curling wand, a toiletry bag, and my make-up bag. All we have left to pack away are our toothbrushes and our sandals which will go in the front pockets. Oh, and by the way. I didn’t even need to use the “expand” feature on this carry-on. There you have it! 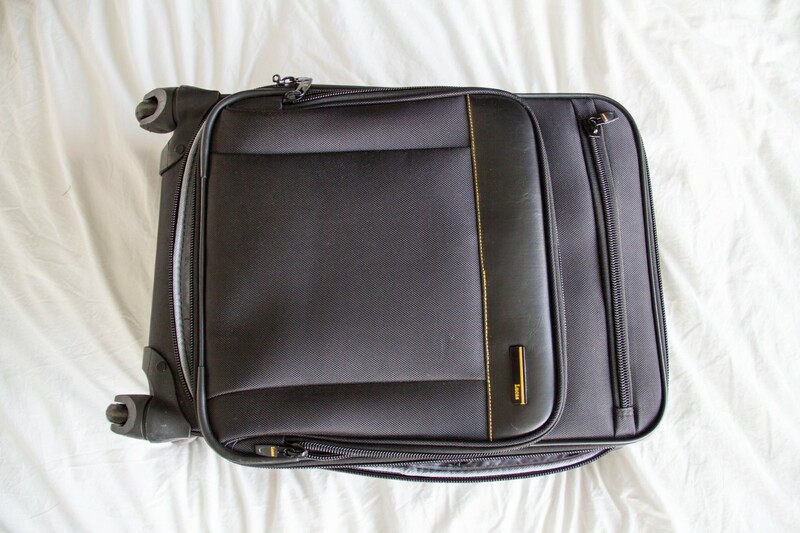 How we pack for a weekend in Italy. All 3 of us in one carry on luggage. We will be carrying a backpack that will have enough diapers for the flight (3-5), wipes, a couple bottles, our passports, wallets, phones, camera etc. I hope this was helpful to some of you! We walked passed the Ajax official shop and museum on the way to the Kooza show a couple weeks ago. I may be the last person to know that it’s pronounced “aYAX” and not “aJAX”. Hm. Sure.